Do your mixes need a bit of analogue-style heat? Analogue recordings and mixes have accustomed our ears to a certain type of warmth, but we now work predominantly in the software world. Digital audio environments can be perceived as cold and clinical when compared to the hardware realm, but we do have the flexibility of exceptional sound quality, almost-infinite headroom, instant recall and advanced DSP technology. The trick is being able to replicate old-school frequency characteristics - namely the hardware-esque frequency response, smooth dynamics, cohesion and aesthetics of a retro mix - within a modern software environment. The trick is being able to replicate old-school frequency characteristics within a modern software environment. While it's easy to strap a plugin over a channel and crank up the Drive knob, it's a little harder to apply these processes methodically. Begin by determining the type of mix characteristics you're seeking. Are you going for a pristine, clinical tone? Do you want cleanliness or warmth? Do you prefer distortion to be audible or invisible? Once you have answers to these questions, you can determine how much drive to apply throughout various stages of a mix. Genres, tastes and client requirements are all factors that will influence your approach. Think of your available drive options as an artist would a paint palette. Become familiar with the nuances of each tool at your disposal. Each saturation or distortion stage will impart its own unique harmonic flavour, colour, tone and response. Smooth, expensive saturation might suit one task, but a cheaper crunch may fit another. Once you know how your own drive options affect a sound, you'll be able to subject mix elements to those tastes. Here we're discussing software drive options, but don't be afraid to run digital signals through analogue signal paths as you see fit - no matter how underused, grungy or lo-fi they might seem. Some digital source sounds can be considered thin or cold. A sample or synth part might have a suitable timbre and character, but perhaps it lacks thickness and weight in comparison to other mix elements. Each saturation or distortion stage will impart its own unique harmonic flavour, colour, tone and response. Saturation or drive can add the harmonic punch required to push an element further forward, rounding out its presence. Layered sounds can benefit from subtle saturation, as the addition of drive and harmonics can meld grouped layers into a single entity. Most drive plug-ins feature an output control, so you can re-level the newly-processed signal with its original state. It's then easy to turn the effect on and off, helping you to evaluate exactly how much drive is needed, and how the processing is affecting the signal. If you've lost too much of the sound's original character, simply mix the effect in parallel via the plugin's dry/wet control, or use an auxiliary return. There's a lot of discussion about mix 'glue' in the production world. Analogue processing, outboard circuits, mixing desks, tape and summing would naturally consolidate signals together; DAWs are clean and mathematically separate. Digital sounds are compiled from a multitude of sources - recordings from mics, analogue synths, software instruments, digital samples and effects. Spiky transients collide and clash, eating up headroom. Treble frequencies can be harsh and abrasive. Luckily, saturation can remove the brittle side effects of digital summing. One straightforward solution would be to strap a single saturation effect over a group and drive it hard. While this can work on occasion, it is going to be obvious to the listener. For a more natural result, pepper your saturation throughout various elements of the mix. Touches on individual sounds, busses and even your master will sum your mix together in a more pleasant way. 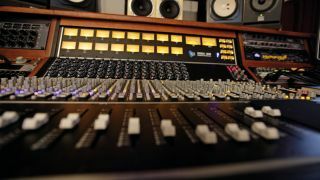 Software mixing desk emulations, such as Slate Digital's VCC and Sonimus' Satson and Britson, can also be used to run your digital channels through a virtual console, giving clinical mixes a warm cohesion inspired by high-end mixing boards. Finally, while drive plugins are often the first port of call, there are other ways to achieve warmth and glue. Dynamic control, smooth transient reduction and musical treble removal can be achieved with other processes like EQ, compression and limiting. For more on mixing with distortion and saturation check out Future Music issue 285, which is on sale now.